Over three years (2014 - 2017), the IRC is developing, implementing and evaluating the COMPASS programme (Creating Opportunities through Mentoring, Parental Involvement and Safe Spaces). This programme identifies, acknowledges, and responds to the vulnerabilities of adolescent girls by establishing a foundation for their healthy transition into adulthood in humanitarian crises. It specifically seeks to improve the prevention and response to violence against adolescent girls in humanitarian settings. This includes strategies such as: safe space programming including life skills training and asset building; mentoring activities with the support of older adolescent girls; and engagement with service providers and caregivers to better prioritise and meet the needs of adolescent girls. 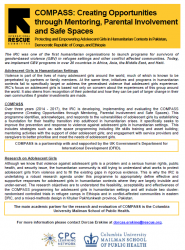 The research objectives of this evaluation are to understand the feasibility, acceptability and effectiveness of the COMPASS programming for adolescent girls in humanitarian settings and will include two cluster-randomised controlled trials in refugee camps in Ethiopia and in conflict-affected communities in eastern DRC, and a mixed-methods design in Khyber Pakhtunkwah province, Pakistan. The main academic partner for the research and evaluation of COMPASS is the Columbia University Mailman School of Public Health.